One of the lessons that comes from extensive travel is this: People are creative…and weird. Just have a look at Nerdabout’s photo essay of the Top 10 Coolest Statues in the World to see what I’m talking about. You gotta love the artistic flair these unexpected monuments can add to your trip. And then, you gotta take a step back and scratch your head. 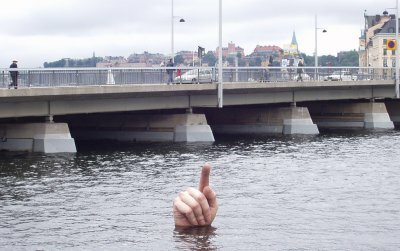 Random index finger emerging from the water in Stockholm doesn’t do it for you? What about Budapest’s melting cow popsicle or the shark crashed into the roof of a building in Oxford? Seriously, check out the link.